Was the wife of Heber the Kenite (Judges 4:17). For receiving the Canaanite leader Sisera as he fled following his defeat by the Israelites under Deborah and Barak. 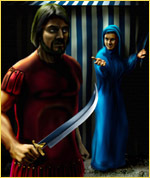 Jael assassinated Sisera. Her action is celebrated in the Song of Deborah (Judges 5:24-27). The above illustration painted by Michael Bennett is taken from the Redemption trading card game and is copyright© Cactus Game Design, Inc. All Rights Reserved. Used with Permission. For more information on the Redemption trading card game visit redemption.com. Web page copyright© 1998-2006 by Christ-Centered Mall.